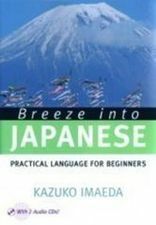 Breeze into Japanese eases the task of learning Japanese with its simple, logical, and fun approach. This book and audio CD set maintains a strong focus on understanding Japanese sentence structure--essential for people who want a solid foundation in the language. Using romaji (romanized Japanese), it teaches authentic grammar, communication knowledge, and cultural awareness for practical, everyday communication. Hiragana, katakana, and some kanji with optional exercises are covered throughout, and in three independent chapters on reading. You'll be surprised at how easy it is to learn Japanese with this orderly, step-by-step approach!